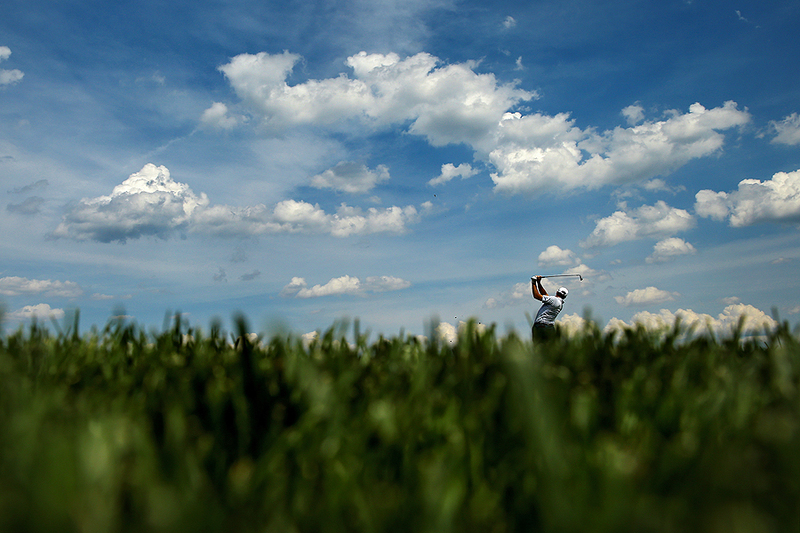 "Michael Thompson of the United States plays a shot on the 17th hole during the first round of the Quicken Loans National on June 29, 2017 TPC Potomac in Potomac, Maryland." One of the easiest thing with documenting golf is making it look pretty. Golf courses are typically immaculately groomed. Lush green grasses, blue skies, sunny weather, and clean backgrounds. With a little zooming and panning of the feet, any photographer can shoot a clean game of golf with a long lens. That means stock and action images alike. However, much like every other sport, shooting with a wide angle can often make a more compelling image. Despite there being no real environment markings helping viewers identify what course the Quicken Loans National was played on, I still like the graphic elements of the above image.